I am in awe of myself! I designed another pair of socks. Sort of. Turns out that I designed a Charlene Schurch pattern - Stems - but not exactly. I'll explain. I found a stitch pattern called Double Eyelet Rib in my Harmony stitch pattern book (old style, published in 1980s). My yarn (which I'll detail later) knit up at seven stitches to the inch. By the way, I take my sock gauges on stockinette rather than the stitch pattern because the gauge determines which stitch pattern I choose. I don't know if this is correct; it works for me. But I digress. Seven stitches to the inch means that I want a stitch count of around 56 to go around an eight inch circumference for leg and foot. A seven stitch repeat going around the sock eight times is perfect. An even number of repeats makes it easy to divide for the instep and foot: subtract four repeats for the foot, which will be plain stockinette. That leaves four repeats for the instep - half and half. row 4 same as 1. Note that the items bolded in the directions above are points of difference between Stems and the double eyelet pattern that I am now calling Raisins. 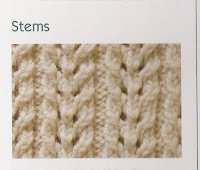 Stems is a six stitch repeat rather than seven. Raisins has two purls between the eyelet holes rather than one. I think this is an improvement in that it makes the sock more ribby, so it stays up well. And then Raisins has a plain knit 1 between the yarn overs forming the eyelets rather than that a knit one though the back loop. I also like my version better here in that it's daintier, but that is a matter of taste. Here is a close up of Stems. I think it looks a bit horsier than Raisins, so as much as I adore Ms Schurch, I'm sticking with Raisins. Here is a picture of Raisins off the foot showing how the ribs pull in. There is no need to block this pattern because the lace spreads out and shows itself when it is on the foot. By the way, both patterns look equally good upside down (pointing down) as right side up (pointing up). This is important because socks are viewed from various angles. Stems can be found in the invaluable More Sensational Knitted Socks which I am linking to Amazon because the book is so great that you should consider buying it if you don't have it already. Schurch helped me by holding my hand through this book and her previous Sensational knitted Socks when I got into sock knitting last year at around this time. But wait. There's more. After I made Raisins, not remembering yet about Stems, I couldn't believe that someone hadn't discovered this stitch pattern because it was so perfect. So I searched double eyelet rib on Ravelry and came up with this. 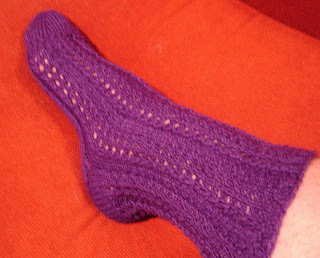 Double Eyelet Rib socks is a free pattern from Wendy D. Johnson. It is an eight stitch repeat that substitutes a purl 1, knit 1, purl 1 for the purl 2 of my design. The eyelet part is more like Raisins, but rather than a sort of trough between the eyelets there is a raised line. It's nice, but I still like mine better. So I remain self satisfied. Now for some more information about Raisins. I used Knit Picks Gloss because they said it was my last chance to purchase this yarn in the color Grape. I had to have it even though I have no purple in my wardrobe and don't even like it that much. The yarn is soft and shiny made of 70% merino and 30% silk. I like that it has silk because silk is a strong fiber and will make up for no nylon in the mix. The yarn is thicker than I'm used to. I got the seven stitch count on the size needle that usually gives me eight stitches to the inch - 2.25 mm. Aside from the beauteous design, the big news here is a new (to me) toe: the round toe from (who else?) Charlene Schurch. Ms Schurch says it is a beautiful toe. Though I wouldn't go that far in describing it, it is pretty. This toe saves you doing the hated Kitchener stitch. But that is nothing to me because I like doing Kitchener. Well, congrats on designing Raisins. It is very pretty and lacy. The name suits the color too. I've knit the Stems pattern, and although I like it a lot, it didn't come out very lacy. Might be 'cuz I did the yarnovers in the non-lace style (what some call the "wrong" way).